Summertime Grilled Bread, Four Ways. You guys. I’m feeling so ollllllld. Like really, really old. Last night I watched my littlest cousin graduate from high school and now I’m all “what! I was doing that five minutes ago. Not 12 years ago. WHAT.” And then I proceeded to listen to Delilah on the radio on the drive home which just proves my age so there you go. Please tell me if you’re driving in the car late at night you listen to that too. It’s feels so GOOD. So wonderfully 90s. It feels like babydoll tees and your first bottle of herbal essences shampoo and mixed tapes while you wear stick on earrings and snap bracelets and way too much Sunflowers perfume. The only good part about being old is that I now feel confident enough to use the grill on my own, as in not-burn-down-the-house-while-trying-to-light-the-grill. Such a big girl now. My infatuation with grilled bread isn’t anything new, really. A few years ago I made this chicken and mushroom dish (one of our faves, I actually made it twice last week) with grilled bread and was insanely HOOKED. It’s one of the few dishes that we make over and over and over again… probably just because of the bread. I literally cannot stop eating it. And I mean that in the correct way. The proper use. Cannot stop. This is the final part of my summertime happy hour with delallo, and this is the recipe I was referring to all week with the omg-it’s-my-favorite talk. This might be rivaling cheese plates for me at the moment. So four ways you say? Yes, four ways. Here they are. !!!! First up, and easy and somewhat boring avocado mash but so not boring when it’s on grilled bread. I like to keep the avocado chunky, mix it with some crushed red pepper, salt and a bit of lime. This keeps it more on the avocado mash side instead of the guac side. I don’t know about you, but for me there are two very distinct camps. I do NOT like guacamole on toast. Just not into it. If it’s on some sort of sandwich, maybe, but when it comes to bread and toast and sandwiches, I prefer some regular avocado – almost plain. Guac on toast is just weird to me. I only want it on chips or on burgers or on ten thousand tacos. Second, I stuffed some pepperazzi with creamy goat cheese. These cute little mostly sweet peppers are one of my favorite things to add to cheese plates. They taste SO good placed on top of the bread and then drizzled with balsamic. Next, I did a little twist on caprese grilled toast with a pesto cream sauce, sliced heirloom tomatoes and fresh mozzarella. And more balsamic glaze because I just can’t quit it. This is absolutely my summer meal of choice and I am already deep in a caprese obsession. Finally we finished it off with a sweet version, which isn’t super sweet but maybe just semi sweet. I whipped some ricotta and added a bunch of vanilla bean paste for flavor – but no extra sweetness. Slice some peaches, maybe some cherries or other fruit and bring out the honey. Spread the ricotta on the toast, top it with some ripe slices and then drizzle that golden syrup on top – it is just.too.good. So see? Now you can picture why I am a total fanatic. You must try this. Puhlease. I will pay you in virtual cocktails. Preheat your grill to the high. In a small bowl, stir together the butter, basil, rosemary and cilantro. 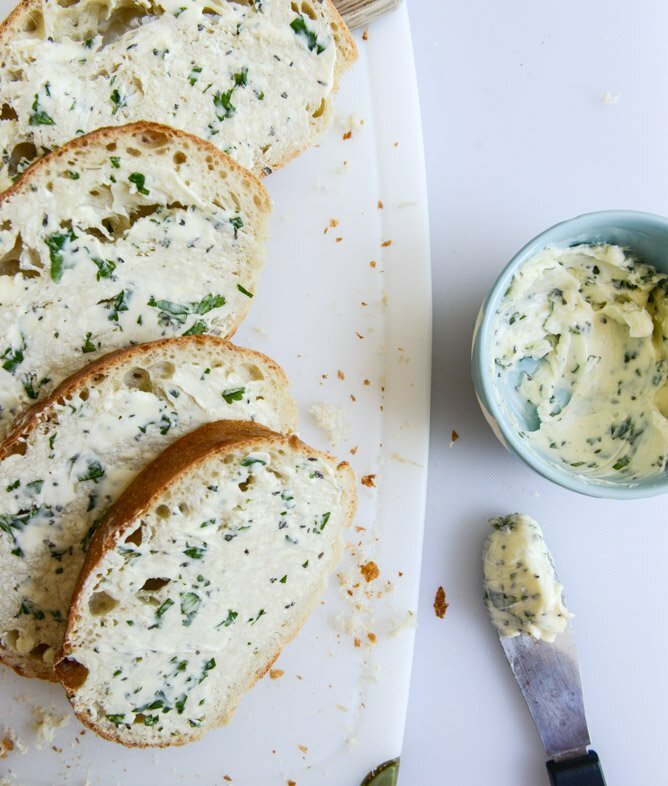 Take 3/4 of the sliced bread and spread one side with the herb butter. Leave the remaining slices plain since they work best with the ricotta and fruit. Before grilling the bread, set out the accompaniments so the bread is warm when serving. I like to mash the avocado with the lime and pepper flakes and place it in a bowl. Stuff the pepperazzi peppers with the goat cheese and place them in a bowl. Slice the tomatoes, slice the mozzarella and whisk together the sour cream and pesto. Finally, add the ricotta cheese to your food processor and blend until completely smooth and creamy. Add in the vanilla paste and blend again until combined. Place the ricotta in a bowl and slice the peaches. In the video, we also served this with bing cherries! Delish. To grill the bread, place it on the grill and grill about 1 to 2 minutes per side. Keep an eye on it as the grill time will depend on where it is placed and how hot the grill is. I like to grill the plain bread first, then I finish with the bread with herb butter. 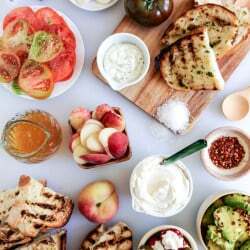 Once all the bread is grilled, set it out with the avocado mash, caprese toppings, whipped ricotta + fruit and the stuffed pepperazzi. Dig in! Lamb Slider Lettuce Wraps with Whipped Feta Spread.